If you see a Premier League full-back flailing on the floor this season, there is a fair chance the player leaving them groping at thin air will be Jefferson Montero. The Swansea City winger is a player whose stock is rising as rapidly as one of his jet-heeled forays down the Swans' left flank. And as Montero's list of admirers grows, so does his collection of demoralised opposition defenders. 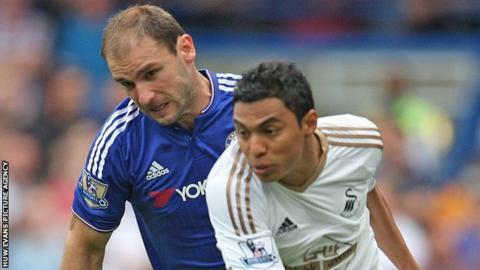 Chelsea's usually indomitable right-back Branislav Ivanovic endured a torrid afternoon against the Ecuadorian as Swansea drew 2-2 with the champions on the opening weekend of the season. Daryl Janmaat then became Montero's latest victim as Newcastle were swatted aside 2-0, the Dutch defender sent off before half-time for persistently fouling his tormentor. A relative unknown quantity when he joined from Mexican club Monarcas Morelia after the 2014 World Cup, Montero is now one of the most feared wingers in the Premier League. Montero's first season at Swansea was hampered by injury, an inevitable by-product for a player whose explosive pace can put a strain on his hamstrings. Even with the occasional lay-off, however, the 25-year-old produced several eye-catching performances. One was his evisceration of Arsenal's Calum Chambers during Swansea's 2-1 win in November 2014 - twisting, turning and nutmegging the fledgling full-back into submission. "I never got to see Stanley Matthews play, but this guy Jefferson Montero has got full-backs on toast." It is only now, however, that Montero seems to have established himself as a first-team fixture, much to the delight of former Swansea, Burnley and Wales winger Leighton James. "Welcome to the bandwagon everybody! I've been on about this guy for 12 months, if not longer," says James. "This guy is potentially world class because he does what wingers are supposed to do. "He beats full-backs and gets the ball in the danger area, and goals are scored from his crosses. It's simple but effective." Those qualities were evident in abundance against Newcastle as Montero drew Janmaat's dismissal, hit the post and provided the assist for Andre Ayew's goal. Swansea manager Garry Monk said afterwards that the Magpies' only answer to Montero's threat was to try and "kick" the Ecuadorian. Janmaat could at least console himself with the fact that he was not the first to be humiliated in such a way. "You saw at Chelsea the damage Jeff can do," said Monk. "I think he showcased that against Arsenal last year as well but we see it daily so it's excellent to have that threat. "I thought he was a threat all day long and you have to feel for my full-backs because I make them train one against ones against him every day." A quiet character who speaks very little English - as his interview with Sport Wales shows - Montero's unassuming off-field persona betrays the terror he instils in his opponents on the pitch. "Jefferson has big qualities when it comes to playing one-on-one. He's quick, he's very dangerous," says Swansea goalkeeper Lukasz Fabianski. "The full-backs are on their own against him and he has the speed to take them on. "Both of them [Ivanovic and Janmaat] ended up chasing him and getting booked. That's very good for us and dangerous for the opposition."